Soak your used cartridges overnight in Dissolve and re-insert them the next morning! 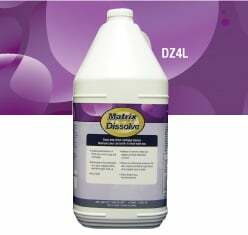 Removes stains and deposits, including urine sediments, uric salts, organic debris, and drain pipe build-up. Also removes calcium, hard water spots, lime build-up, and black streaks. Use in flushing urinals, sinks, drains, and toilets as well. Eco-safe. Contains no abrasives, phosphates, acids, or VOC's.